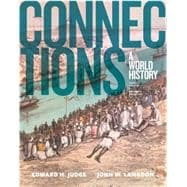 by Judge, Edward H.; Langdon, John W.
Connections: A World History introduces students to the far-reaching study of world history in a comprehensible manner that is tailored to meet their diverse needs and interests. This Third Edition strongly emphasizes thematic connections between societies and events, making it easy for new history students to absorb a wide array of details, dates, and events. The title’s concise chapters feature engaging, readable content, and avoid bogging students down with unnecessary detail. The authors have provided many visual aids to improve students’ comprehension of the material, including over 200 maps. The result is a clear and concise rendering of world history that will appeal to students of all disciplines and backgrounds. MyHistoryLab for the World History course extends learning online, engaging students and improving results. Media resources with assignments bring concepts to life, and offer students opportunities to practice applying what they’ve learned. And the Writing Space helps educators develop and assess concept mastery and critical thinking through writing, quickly and easily. Please note: this version of MyHistoryLab does not include an eText. Connections: A World History, Third Edition is also available via REVEL™, an immersive learning experience designed for the way today's students read, think, and learn. Edward H. Judge and John W. Langdon are professors of history at Le Moyne College, where they have team-taught for the last 20 years a two-semester world history course for first-year students as well as courses on modern global history for upper-level students. Judge earned his doctorate at the University of Michigan and spent a year in the USSR as an IREX scholar. He has taught at Le Moyne since 1978, was the college's scholar of the year in 1994 and was awarded the J. C. Georg Endowed Professorship in 1997. Langdon earned his doctorate at Syracuse University's Maxwell School of Public Affairs, where he was a national defense fellow. He has taught at Le Moyne since 1971, directed its honors program and was awarded the O'Connell Distinguished Teaching Professorship in 1996. Each has been named the college's teacher of the year and has chaired its department of history. They have written or edited eight books: three in collaboration with each other, three as individuals and two in collaboration with other scholars. They love teaching world history, especially to students of diverse backgrounds and interests, and they derive great joy from infecting their students with a passion and enthusiasm for the study of the human past.